Check out some of my eLearning samples below. 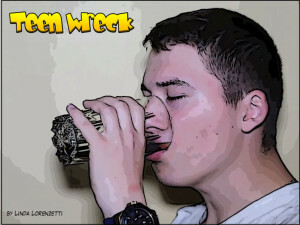 This course, Teen Wreck, was entered in the 2015 Articulate Guru Awards. It’s purpose is to educate teens about what to do, and not to do when someone is drunk. I found that there is a lot of misinformation out there that could cause a bad outcome for inexperienced teens. My hope is that this could be used to educate teens so that they can make good decisions by remembering the scenarios in this course. Although it is meant for teens, I know a lot of adults that have learned something from taking this course too. I built a moving timeline to feature some of my many elearning challenge entries. Slide the arrow at the bottom left of the interaction to see more. Here is a short learning sample that was featured on Articulate’s Elearning Heroes, Elearning Examples webpage. 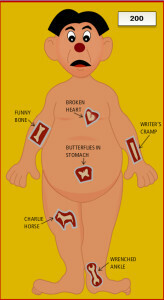 It uses comic style panels to teach learners how to react to common challenges that they’ll encounter in the hospital. It also provides instant feedback so that learners can learn how to improve their performance. This scenario is also from Cathy Moore’s blog. This is an Ergonomic Assessment Tool that I created for an Ergonomics eLearning challenge. 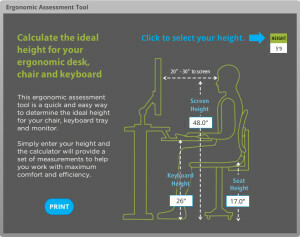 It gives you baseline measurements for your chair, desk and monitor positions, based on your height. It also has a print function so that you can record your results (the print function works best with Internet Explorer). 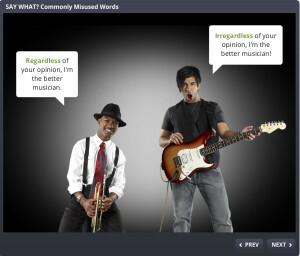 This interaction that was featured on Articulate’s Elearning Heroes, Elearning Examples webpage. It is based on a scenario from Cathy More’s blog designed to teach wait staff to work safely. What I like most about it is that not only does your learner make a choice, they must justify their answer. This course, simulates the experience of working for airport security, x-raying baggage. It uses gamification to teach the learner how to identify weapons packed in luggage. You must determine if there is a weapon in each bag and then, if the answer was yes, click on the weapon. Points are awarded for correct answers. 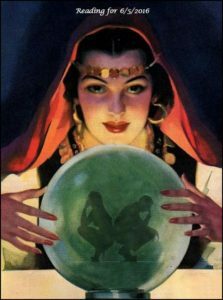 There are three possible story outcomes, based on how well you do at this game. Captain Challenge has been featured on Articulate’s Elearning Heroes, Elearning Examples webpage. It is a comic strip course that I made for a weekly challenge. It’s purpose is to explain a math concept to children. The comic look and feel of the course engages children so that they are more receptive to learning. There are three math video-type games at the end of this course to reinforce the concept that was taught. 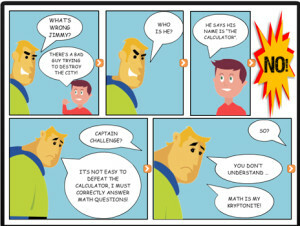 Help Captain Challenge to defeat the evil calculator by clicking on the launch button below. Players of this game must identify serif font characters by clicking on them. You must identify all of them on the screen within a short time period to win. I made an online version of the game, Perfection for the classic board game elearning challenge. 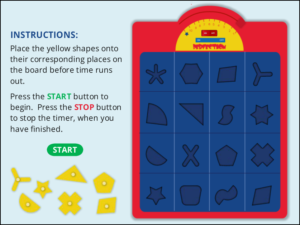 You must match each shape to it’s hole, but you’d better be quick because you only have 40 seconds before the timer runs out. This fun interaction tells the story of a bedbug infestation from the bugs point of view. 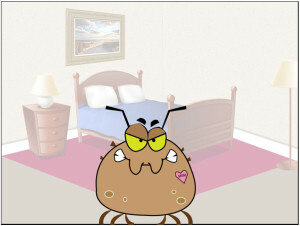 Test yourself to discover if you can you find all seven bugs that are making themselves comfortable in your bedroom. This is based on an amazing animation I saw on Dribble. I challenged myself to replicate it as closely as possible, using Storyline 2 animations and transitions. 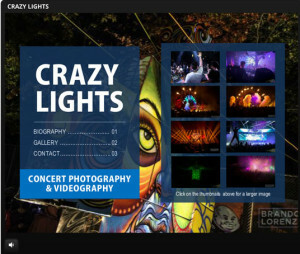 Most of the images were made in Storyline. Warning, due to the size of this file, it may take some time to load; but prepare to be amazed. Relax and take an adventurous elearning road trip with this scrolling roadway with many animated surprises. This slider interaction was featured on Articulate’s Elearning Heroes, Elearning Examples webpage. 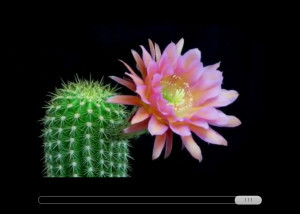 Watch the flower bloom as you move the slider to the right. This is an interaction that I made for a non-linear navigation challenge. I wanted to create a slick, magazine style website look with transparencies and animations. I used photos from my son’s portfolio for the content. 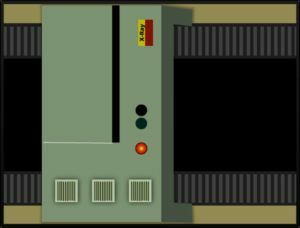 This interaction was built for a video player challenge. 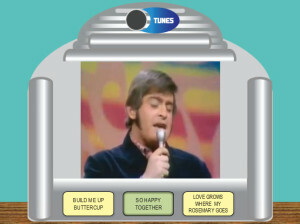 It features an old diner type of jukebox video player interaction. It plays three retro, lighthearted songs with a Guardians of the Galaxy feel to them. 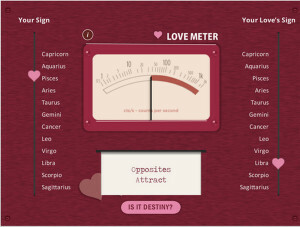 The Love Meter is a fun sample that was featured on Articulate’s Elearning Heroes, Elearning Examples webpage. I made for a Valentine’s Day eLearning challenge. I used two sliders to determine if your partner match was made in astrological heaven, or um…something else. See if you’ve met your match by clicking on the launch button below. This course was featured on Articulate’s Elearning Heroes, Elearning Examples webpage. If you have ever cringed when hearing someone misuse the English language, Say What? is the course is for you. Visuals were added to simple multiple choice questions to create an engaging interaction. For each example, two characters will use different words to express the same meaning and it’s up to you to choose which is correct. Operation Storyline is featured on Articulate’s Elearning Heroes, Elearning Examples webpage. It is an online version of the popular children’s game. 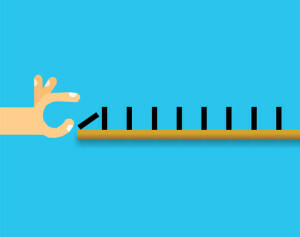 I made this for the weekly challenge Using Toys to Design Playful eLearning. My biggest challenge was translating a 3D game into a flat online version. See what I came up with by clicking the launch button below. 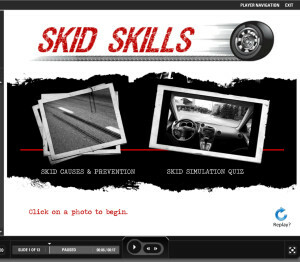 I received Honourable Mention for my entry in the 2011 Articulate Guru Awards, Skid Skills. This course was built in Articulate Presenter. You can see it in action here.